Location. 34° 14.082′ N, 77° 57.324′ W. Marker is near Wilmington, North Carolina, in New Hanover County. 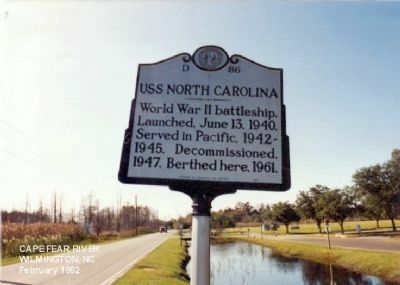 Marker is on USS North Carolina Road, on the right when traveling west. Touch for map. Marker is in this post office area: Wilmington NC 28401, United States of America. Touch for directions. Other nearby markers. At least 8 other markers are within walking distance of this marker. U.S.S. 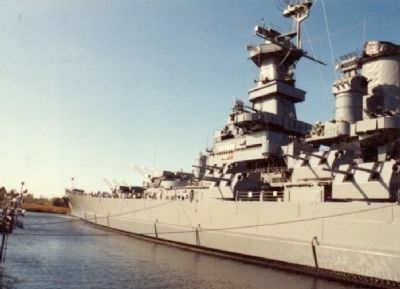 North Carolina Battleship Memorial (about 700 feet away, measured in a direct line); Beery's Shipyard (approx. 0.3 miles away); William Tryon (approx. 0.3 miles away); George Washington (approx. 0.4 miles away); General Benjamin Smith (approx. 0.4 miles away); Cape Fear Club (approx. half a mile away); Fanning House (approx. half a mile away); William E. Worth House (approx. half a mile away). Touch for a list and map of all markers in Wilmington. More. 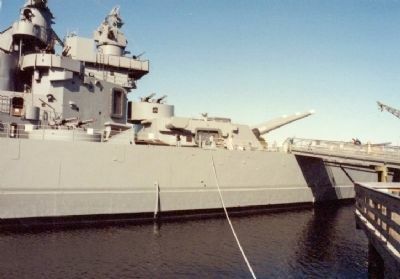 Search the internet for USS North Carolina. Credits. This page was last revised on March 15, 2019. This page originally submitted on January 10, 2013, by Don Morfe of Baltimore, Maryland. This page has been viewed 409 times since then and 6 times this year. Photos: 1, 2, 3. submitted on January 10, 2013, by Don Morfe of Baltimore, Maryland. • Craig Swain was the editor who published this page.